Designs feature both his latest fabrics and his much-loved classics, mostly from the Kaffe Fassett Collective but also his latest collection of Artisan fabrics. 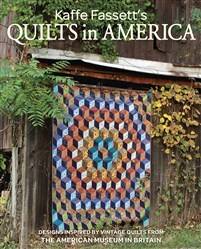 An introductory section features the original quilts that inspired Kaffe, and tells the reader something about their provenance. The new designs demonstrate Kaffe's vivid and unique color combinations, giving new meaning to familiar block patterns such as Tumbling Blocks, Starbursts, and Log Cabins. Photographed in bucolic Bucks County, Pennsylvania. Each pattern contains full step-by-step piecing instructions and detailed diagrams.